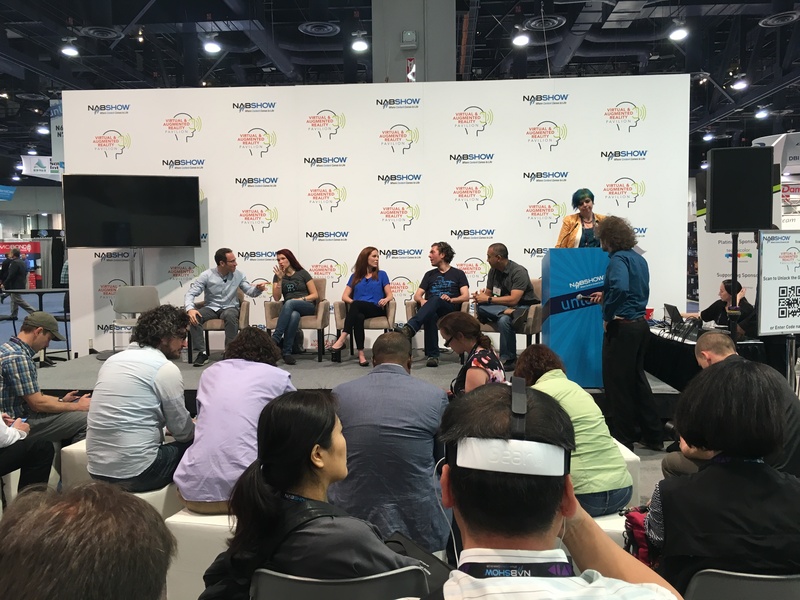 More than 103,000 attendees paraded through the halls of the Las Vegas Convention Center this week for the largest electronic media conference, the NAB Show. The National Association of Broadcasters expo takes place each April and draws in exhibitors from 166 countries, showcasing the latest and greatest of media and technology. This year, drones, live-streaming devices, virtual and augmented reality set the tone for the six-day convention. And, while a large part of the excitement at the conference centered on hardware and technology, demonstrations and conversations made it clear that the impact of storytelling hasn’t really changed. What has changed is the vehicle used to deliver that meaningful content. 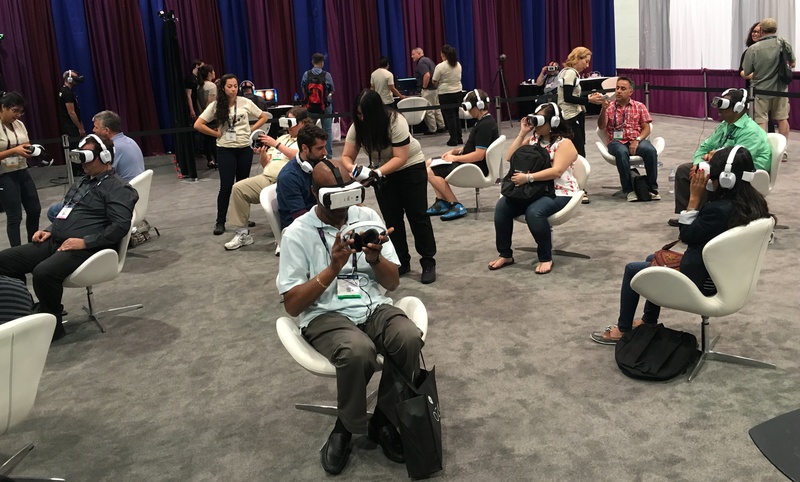 Leading tech companies and content producers of VR colored the Virtual and Augmented Reality Pavilion with large screens, lounge areas filled with curious consumers sitting with headsets and various gear atop their heads. Kaleidoscope, the largest community of VR content builders worldwide, highlighted the week with a three-day showcase of their 30 cinematic experiences. The films were chosen as the “best ofs” from their current world tour. Presented by Jaunt, experiences ranged from 2 to 15 minutes and were shown on Oculus Rift, HTC Vive, and Samsung Gear VR. 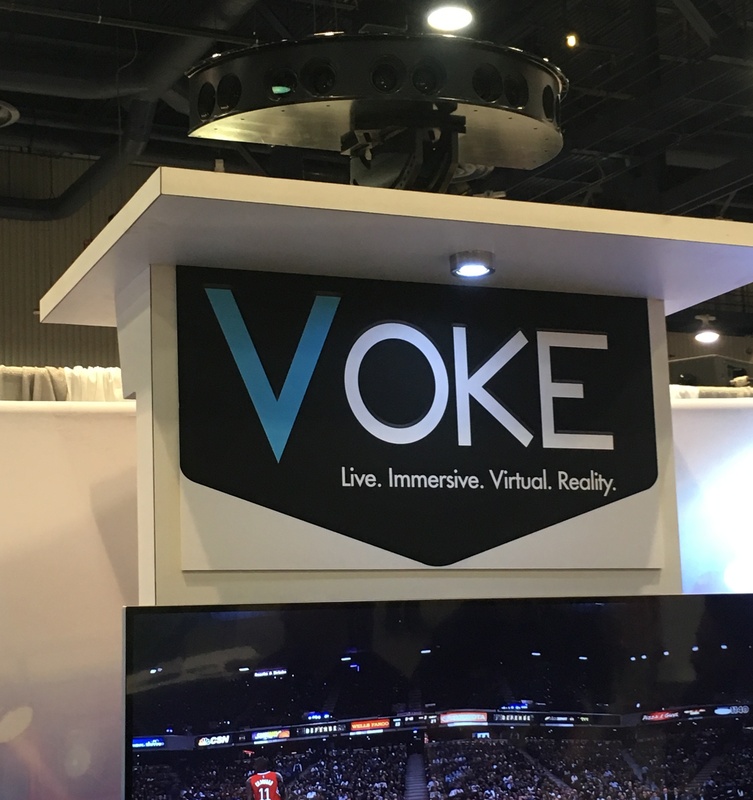 Voke, which produces real-time virtual experiences at events, displayed their full depth-perception platform, enhancing immersion of live entertainment and sporting events. Voke uses Oculus, Gear VR, Google Cardboard, and Apple and Android devices, and is available on all major operating systems. The NCAA Final Four championship game was streamed live via Voke. Available in the Oculus Store, the game allowed basketball enthusiasts to experience a 180-degree stream of the action, complete with a virtual scoreboard and live stats. Washington State University was the first football stadium to use Voke for fan engagement. The user is able to focus on the players, coach, or sidelines during live action and replay. Nokia unleashed its professional virtual reality camera, including live VR broadcasting, 3D stitching and a VR player technology using OZO Virtual Reality Solution for content creators. The camera contains eight lenses and microphones, providing a 195-degree field of view per lens with 360-degree sound. With only nine pounds, the camera is compact, can withstand varying temperatures and allows up to 45 feet of wireless recording. The common thread throughout the panels, lectures and presentations was not focused on the logistics of improving production and hardware, however, but instead on creating stories appropriately executed through virtual reality. The Future of Cinematic VR panelists discussed moving away from the hardware question and into the monetization phase. “What we’re seeing on the commercial side are agencies and brands that want to engage in this VR space because it’s new,” said Aruna Inverson, of Immersive Media. “It always comes back to compelling content,” said Jason Goodman, founder of 21st Century 3D. Panelists made the argument that any story could be told in virtual reality, but the point was whether it needed to be. Ryan Pulliam, CMO and co-founder of Specular Theory, emphasized the idea that throughout traditional media, there has always been a space between the story and the user. The difference with VR compared to TV, Internet and now mobile, is that through VR the user is immersed into an experience. “Unless they physically remove the headset from their head and change the experience, you’re guaranteed that they are looking at the content you put out there,” Pulliam said. With the Kaleidoscope showcase became an example that headsets hardly matter to the user. The innovative narrative is translated through the different hardware, captivating the user’s mind. I watched “Jet Lag,” a 9-minute 360-degree video on the Gear VR. This was my first experience using Gear, and took a few blinks to adjust to. The story drops the user into a scene in India, where the landscape appears vast and the dresses beat with color and vibrancy. The tale is of two lovers separated by continents, questioning their bond. They dance and exchange rhythmic audio messages, making the user really ache through their distance. “Tana Pura” is an audio-visual experience set to music composed by Jonny Greenwood. Colosse is an animation that explores fear, power and respect through the characters of a story on Great Spirits. Jocelyn Apodaca is a graduate teaching assistant and journalism student at University of Nevada at Las Vegas where she teaches an entry level journalism course implementing mobile devices into the classroom.